Our team of specialists fulfills requirements and exceeds expectations. FairLifts provides instant access to every possible type of commercial and executive helicopter service. All classes of helicopter are available at a moment’s notice to facilitate even the most complex requirements with ease. Heavy lift, aerial crane, and executive charter needs are expertly defined and swiftly carried out. Recurring pipeline inspections and energy product transports are planned for maximum efficiency and cost reduction. We look beyond standardized requirements to best fit the professional needs of each client. Ferry time cost reduction methods, load breakdown, congested flight plans, road closure procedures, and FAA filings are a select few of the tasks at which we excel in comparison to the competition. Paying attention to the details that matter, we have obtained years of valuable experience in all manner of work; lifting everything from a standard commercial AC unit to a live Manta Ray. One consultation with us is all it will take to assure anyone of our capabilities for all your helicopter needs. Construction helicopter solutions with FairLifts span a wide range of services. When a job is in need of a helicopter solution, we utilize our vast professional network to locate the right pilot and operator to perform the mission. When you contact us, you are given a personal agent to consult with you on each project facet to determine what type of aircraft, specialized additions in mechanics and pilot for you. From heavy lift helicopter rentals to air cranes utilized by NGOs and government entities via government contracts for wildfire containment and extinguishing to energy resource conveyance for the oil and gas industries, we can organize the service to exceed your company’s or industry's needs. 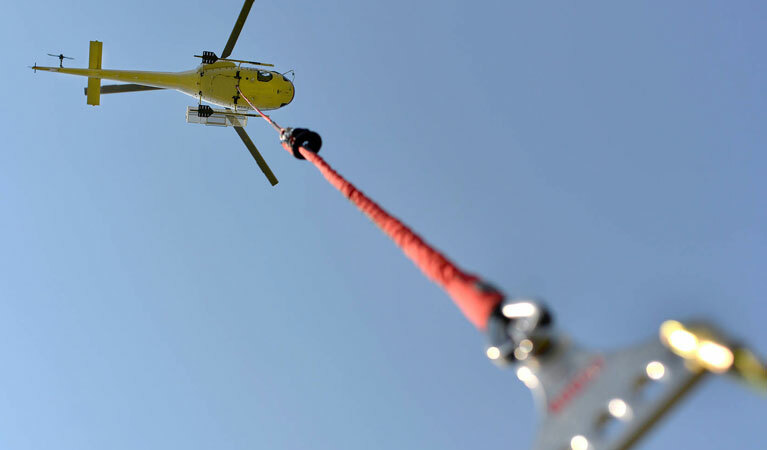 Heavy lift helicopters are a perfect solution for those in need of air crane support in those tough to reach areas. Not only can we reserve a helicopter to replace a ground crane, but we can also utilize a heavy lift helicopter for the transportation of oversized items from point A to point B. Helicopters provide a flexible means of conveyance for building materials, towers and those items requiring the ability to lift heavy objects. Helicopters will also provide you with a much more convenient and less time consuming way to deliver or lift items to remote locations and those in areas that otherwise would not be reached with traditional cranes. The precision gained with a helicopter is your best choice to mitigate risk and save time as well as money. We can facilitate the transport of important freight and or documentation rapidly and discreetly. For large freight, a helicopter can offer the heavy lifting capability to ship items last minute and get them across town or across the country quickly. We know how competitive the realm of professional pursuits is, it's imperative that sensitive documents containing vital information and plans are kept out of the wrong hands or are never left available to comprise during the transportation process. Expert helicopter airfreight service providers are well versed in the art of discretion and know what it takes to maintain the integrity of documents and freight. They are also aware that in cases where transport of documents is necessitated, these items are usually expected to arrive within a specific time frame, we can serve to make certain everything happens per your specifications. Heavy lift helicopters and air cranes have been integral in the construction of utility transmission lines all across the world. 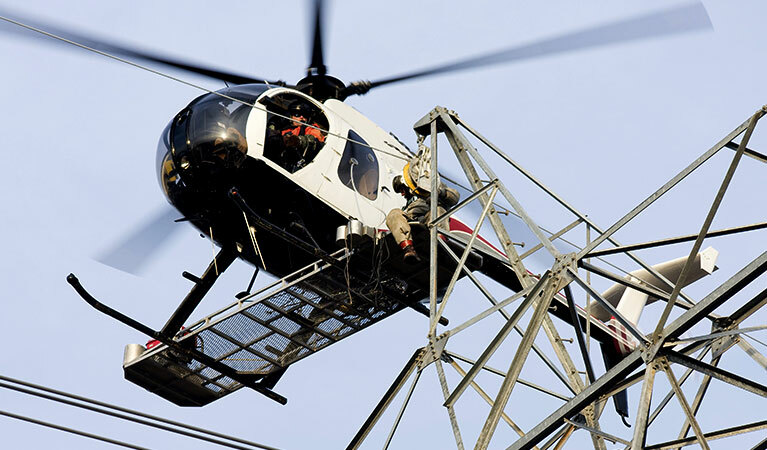 Aerial installation of utilities is preferred because helicopters can achieve access to locations that may be remote or underserved, are difficult to traverse or may be environmentally challenging. A point, in fact, helicopter usage in the establishment of transmission lines minimizes damage to existing or fragile environments up to 95 percent and helicopters additionally have been shown to have diminished right of way intrusion. They are significantly faster at completing the process of establishing utilities in newly developed areas as well. 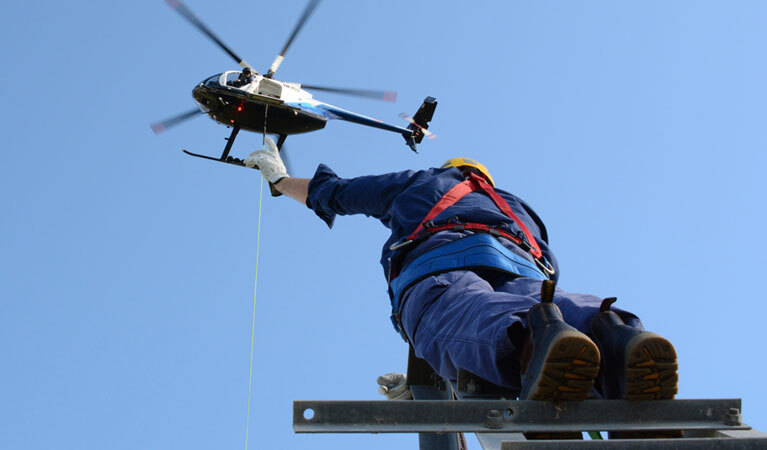 The installation of poles, stringing of wires, hanging of insulators and accouterments, when facilitated via the use of helicopters, can be completed in a fraction of the time. Get to and away from the airport in record time via helicopter services. When it comes to getting to your hotel or accommodation quickly, there is no better way to do so than by helicopter. Airport transfers and hotel pick-ups are conducted with ease in a helicopter. Experienced pilots can safely pick you up directly from the airport and deliver you to downtown heli-ports making a convenient travel time that transcends above all of the airport or downtown traffic. Flights can be customized with additional stops and group flights allow for you and your fellow travelers to all get to your destinations safely. Simple, swift, and stylish translates into successful with our helicopter hotel pick and drop off services. Nothing is more impressive than picking up a potential client or investor in a helicopter. Helicopters offer you the ability to show build sites, or current installations easily as well as entertain VIPs while they are in town. Deliveries include those to airports, accomodations, golf courses and many more locations that will create the image you are looking to show those needing to be impressed. For example, you can take an associate from out of town on a sightseeing tour of your city after dark, fly over an important job site or give the bigwigs an impressive aerial view of the building you’re engineering or the subdivision wherein you’ve recently broken ground. The lifting capabilities of helicopters go beyond just simple heavy lifting or in the construction industry. For example, we have facilitated the needs of law enforcement in search and rescue or retrieval operations, in the case of emergency scenarios for disaster relief and humanitarian efforts. We can offer scheduling for flights to assist those in the agricultural, environmental, utility and oil and gas industries. The versatility of helicopters affords them the ability to assist in small projects as well as those requiring recurring service or IFR and VFR operations. Whether the helicopter service is needed for lifting lumber or the aircraft is simply needed to provide the best view for search and rescue, the sky’s the limit in terms of how we can assist you in any lift project you have. To get more information about the comprehensive range of industrial, agricultural, medical and executive helicopter solutions, contact one of our expert customer service agents and let us put together the right quote for you.